In a recent chat with a younger friend at church, he expressed a desire to find the right balance in his retirement stewardship. He didn’t use that phrase specifically, but that’s how I understood him. He was talking about his financial resources in general, but planning and saving for retirement is part of that equation. He wants to honor and obey the Lord in his stewardship. In so many words, he said his challenge is assuring that his family’s spending, saving, and giving are at the right levels in terms of what the Bible teaches. I have to say, I am encouraged when I encounter young men like this – men who want to be intentional about how they use the resources God has entrusted to them. My friend is doing well in his career. And like so many of us, he knows the relentless draw of the world telling us to spend more and more, and also the voices urging us to save more, especially for retirement. He also knows that the Bible promotes sacrificial generosity, hence the need to find the right balances between these things in a way that is true to the teachings of Scripture and God’s will for him and his family. There are no easy, black and white answers to my friend’s questions. Except for the mention of a ten percent tithe in the Old Testament, the Bible doesn’t assign numbers or percentages to these categories. It doesn’t draw a line that says you can’t spend more than ‘X’ or that you shouldn’t save more than ‘Y’. God leaves that up to us, but we are not without guidance. What the Bible does say is to love God and people, not money and possessions. And it calls us to generosity – sacrificial giving out of a heart of love and gratitude to God for all the gifts he has given to us. The Bible also reminds us that we need to provide for our families and to wisely save for needs that we know we are going to have in the future. My approach to trying to answer this question in relation to planning for retirement is to view it from a stewardship-based perspective – the principle that God owns everything and whatever we have has been given to us by God to manage in his behalf. As I have studied and written on this subject I’ve found, as with so many things in the Christian life, there can be extremes. Riches can be deceptive and even ruinous to the Christian, but does that mean that it is sinful to acquire wealth? Hoarding wealth is idolatrous, but does that mean that you shouldn’t save anything for retirement? Generous giving, especially to the needy, is highly commended in Scripture, but does that mean that you can’t spend money on a family vacation? Although these questions are difficult to answer, one way is to try to balance the various biblical teaching for each one within the overarching principle of stewardship. We must remember that the Bible continually pushes us toward the priorities of loving and serving others through the fruitful generosity of our time, talents, and treasure for the sake of the Gospel and the expansion of God’s Kingdom. Balance is an important aspect of the Christian life. For example, as we seek to obey God, we don’t strive to be faithful in some areas (e.g., vocation and ministry) at the expense of others (e.g., parenting and family) – we have to apply his Word to all spheres of life. However, we can be prone to extremes. As a husband, my wife helps me to stay in balance. She reminds me of priorities and lets me know when I am neglecting something. Husbands and wives need each other for that purpose, among others. 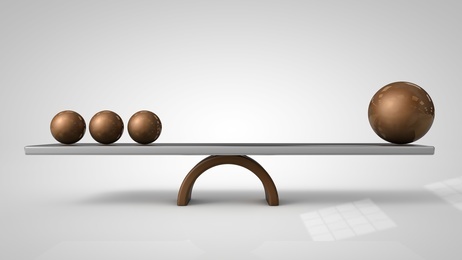 Balance is not a distinctly Christian or biblical concept. In fact, you will see it alot in popular books and other media. The kind of balance that I hear promoted most often is ‘work/life balance;’ it’s a familiar mantra in the workplace these days. And generally speaking, it is a good idea to have a balance between your work and other responsibilities. We can probably agree that balance is a useful concept – it helps us avoid extremes in attitudes or behaviors. But we have to be careful here. The Bible teaches a balanced life in many ways, but not as much in others. We can’t balance God’s eternal Word with the wisdom of the world, which is passing away. We can’t balance love of God with love for money since the Bible sternly warns us to avoid it. One could say that many biblical characters did not live balanced lives, at least not how we would define them. Isaiah the Prophet? John the Baptist? They weren’t very balanced. I think the Apostle Paul lived a pretty unbalanced life – he had a singular mission and purpose: proclaiming the Gospel and promoting the expansion of Christ’s kingdom to the exclusion of almost everything else. In a culture where the self-help/improvement movement is the gospel of the age, having a balanced life can be a kind of personal salvation that is achieved through the inner power resident in each of us to bring everything into balance if we try hard enough. Having achieved balance, we are somehow better human beings. But as Christians, we don’t look inwardly to see how we are out of balance – we look to Scripture and Christ himself as we can easily deceive ourselves about what a balanced life really looks like. Once we have accurately assessed our stewardship with Scripture and the teachings of Jesus, and the Holy Spirit has shown us where we are out of balance, we then have the opportunity to repent and realign with God’s Word. Another problem is that the concept of a balanced life assumes that the various aspects of our lives are binary continuums. Not everything is a stressful tension between one extreme and another that must be balanced as though whatever is in the middle is always the right thing to do, biblically speaking. Sometimes one of the extremes is more biblical than the other. None of us are perfectly balanced. We tend to gravitate toward the ideas and lifestyles that attract us the most and away from those that don’t. And even if the middle ground isn’t always best, finding the right balance based on biblical guidance and wisdom is an excellent way to go. We work to provide the income that we need to spend, save, and give. But there are two extremes to work: laziness and slothfulness on the one end and ‘workaholism’ on the other. We are instructed to work hard and provide for our families and to bring glory to God (1Tim.5:8); but not so much that our work becomes an idol leading to workaholism (i.e., too much work, too little life). Symptoms of workaholism include little or no time for involvement in the local church, limited involvement with children, and not making time with a spouse a priority. There is a definite pattern of work and rest in the Bible that we would be wise to integrate into our own lives (Psalm 127:2). In this context, resting would include spending time with family and friends, serving others, etc. The Bible, on the one hand, seems to condone saving for future needs, such as retirement, but also admonishes us not to become a hoarder or a cheapskate (i.e., too much saving and not enough giving or wise spending). Saving for short-term emergencies and longer-term needs, such as paying the bills when we are no longer working for a living, can be very wise (Prov.21:20). Although retirement isn’t explicitly addressed in the Bible, it will be a reality for most of us in one form or another, sometimes by choice but also for reasons that are outside our control. Therefore, a reasonable amount of planning and saving for that time in life is warranted and wise. Consider establishing a “savings finish line” for a time when you think you have enough. Some Christians believe that because the Bible says to “owe no man anything” (Rom.13:8), it prohibits any form of indebtedness. Those on the other end of this spectrum see no problem with borrowing, and if ‘stuff happens,’ and they’re unable to pay it back, then so be it. There is a more moderate position that would view non-secured (e.g., credit card) debt and secured loans, such as automobiles or home mortgages, differently. In this view, the former is to be avoided and the latter used wisely and only when necessary. And even then, the debt must be repaid (Psalm 37:21). Also, when it comes to credit cards, there are those who would never own one (Dave Ramsey, for example. If he did, it would have a zero credit limit.) Then there are those who use them for everything to get points and cash back BUT they also pay them off every month. If you find yourself sinking deeper and deeper into debt, you are becoming a “slave to the lenders,” which is contrary to biblical teaching. You may need to take drastic steps to get things into balance, and they will take time. I strongly recommend the “debt snowball” popularized by Dave Ramsey in Financial Peace University (FPU). The Bible encourages us to do many things to care for ourselves and our families, and we neglect them to our detriment. On the other hand, God promises to care for his children. In this case, it’s not so much finding balance as both are equally true; we can neither ignore God’s providential care for us nor neglect to do the things he tells us to do. If we put all our faith and trust in our efforts, we become functional atheists. If we do little for nothing for ourselves and presume on God’s kindness and mercy, we may be disappointed. So, on one extreme, people can work so hard to prepare for retirement that they no longer feel the need to depend on God. On the other, you have people who do nothing and might become a burden on their family or the government. If you have tendencies toward one or the other, ask God to help you find the balance you need to fully trust in him while also doing what you can to plan for your future. For some, there is no retirement in the Bible. For others, retirement is valid and even desirable; it’s an opportunity to relax, enjoy oneself and do the things they have always wanted to do. Perhaps the ideal balance is somewhere in-between: A slower pace of life, time for yourself and your family, but still opportunity to serve as long as you are able. Retirement is not a rejection or an abdication of the lifelong call to service – it can be a God-given opportunity to adopt a different way of life in keeping with our season of life. As we grow older, we may want less responsibility and a slower pace than when we were younger. So for some of us a phased retirement may be appropriate, say 65 to 75 as semi-retirement, and 75 or 80 onwards as fully retired, depending on our ability. For the boomer generation, “finding and living your passion” in retirement is all the rage. On the surface, that sounds pretty good – figure out what you love to do and do it. For Christians, an alternative view might be that our main passion should be to live for God and his glory. Our other passions, which tend to be hobbies and other recreational activities, are secondary. If we try to balance those two, we may get out-of-balance from a biblical perspective. You are free to look forward to retirement as an opportunity to do more of the things you enjoy, but don’t pursue them at the expense of the things that God has called you to do in service to him and others. It is important that we accept the reality of old age and bear good fruit as long as we are able. Persevering to the end is a testimony to God’s faithfulness to us. The reality is what Paul precisely told us in 2Cor.4:6: There is an outward decline, but old age can be a time of inner renewal. We still have an opportunity to glorify God and to continue to follow Jesus in a new season of life. The extremes that I described in the above section (however exaggerated they may be at times), tend to have something in common. On one end, it’s all about us; on the other, it’s about God and others. The healthy tension that we have in our lives is that we do have to tend to our affairs, but never to the exclusion of our number one priority, which is to love the Lord our God, with all our heart, soul, mind, and strength, and to love our neighbors as we do ourselves. In that sense, there is no middle ground. So, when it comes to finding balance, the key would seem to be to put the most focus on the Godward end and by doing so bring the others into balance. But we have to start and end with grace – we can only achieve that by the grace of God. One of the main ways we experience God’s grace is through the spiritual disciplines, which means being in the Word, in fellowship, and in prayer. As we pursue a relationship with Christ, he will become the sum and substance of all our affections and our purpose for living, not money and material possessions (Matt.6:33). Because we have the heart of Jesus, we will become more others-focused and willing to serve others with the gifts that God has given us – that is a truly balanced life.